Commercial roofing can be a demanding business and can include a wide range of roofing materials including sheeting, cladding, asbestos, roofing insulation, sheeting removal, guttering as well as waterproofing and felting. The Lyons Roofing Company strives to ensure every job runs smoothly. We work closely with building owners and managers, to ensure the smoothest project possible. 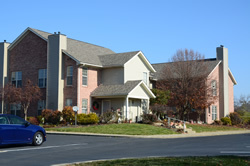 With extensive knowledge and experience installing and repairing commercial roofs, apartment buildings and non-profit organizations in southern Indiana and the Louisville, Kentucky surrounding areas. The Lyons Roofing Company takes great pride in our attention to detail and customer service in all stages of a roofing project. From the initial roof inspection to follow-up inspections after project completion, customers satisfaction is our number one concern. No commercial roofing project is too big or too small for the Lyons Roofing Company. We offer fast and professional service on all commercial roofing projects, as well as custom-tailored maintenance programs to keep your roof performing. Should your property’s roof fall into disrepair, The Lyons Roofing Company will be able to assess and repair the roof as quickly as possible. The longer you wait to repair a damaged commercial roofing system, the more costly the expense.